With today’s high-energy feeding practices, the cows’ natural buffer of saliva is pushed to its limits. Hitting this limit means excess acids can build up in the rumen and cause poor feed efficiency. Zeolites feed additives such as Min-Tech have a quantitative effect on digestion by influencing rumen retention time or alteration of the turnover of fluid and particulate phases of digesta that creates optimum performance. Zeolite feed additives will provide a more stable rumen buffer with respect to nitrogen availability that is beneficial to both rumen microbial fermentation and animal performance (Sweeney,T.et el. 1983). Through their ion-exchange selectivity, Zeolite minerals act as an anti-caking agent for the adsorption of excess rumen Ammonium after feeding and gradually release it as the Zeolites are regenerated to their natural state by cations found in the saliva. Rations depend on desired results and nutrient values of current feed. Zeolite feed additives will also improve the physical characteristics of feed by increasing the flowability, reducing moisture levels, and acting as an anti-caking agent. Clinoptilolite Zeolite is used by livestock farmers as a feed additive for both dairy cows and beef cattle, as a direct replacement for Sodium Bicarbonate with numerous additional benefits. Zeolite is a great anti-caking agent and rumen buffer since is one of the only naturally occurring negatively charged minerals in existence, numerous benefits in the feed process can result from its basic chemistry. Zeolite is inert, stable, and non-toxic. Zeolite and Ammonium play an important role in nitrogen supply in the rumen. When Zeolite is fed to animals, it absorbs much of the ammonia generated from the Non-Protein Nitrogen (NPN). our Zeolite feed additive acts as a reservoir and a slow release mechanism for the nitrogen. This allows you to feed more NPN. The introduction of Zeolite into animal feed improves animal growth and weight gain by increased feed conversion. Zeolite also effectively absorbs many mycotoxins and aflatoxins, in turn having a proactive effect against the development of aflatoxicosis in farm animals. The strong affinity for ammonium also provides superior odor control and healthier local environment. It lowers the risk of toxicity from the increase of Ph levels in the rumen and increase of ammonium levels in the blood serum. Zeolite acts as a rumen buffer for the total digestive tract. High CEC levels of 1.9 to 2.5 equates to more buffering. 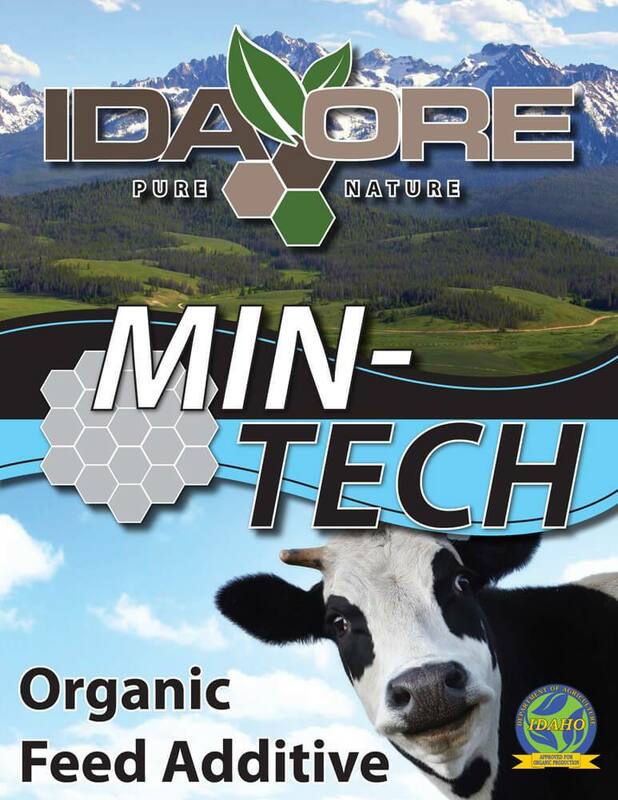 Once Zeolite leaves the cow, it will be fully loaded with Nitrogen and ready for use in fields or compost. This bound Nitrogen is unique in the sense it will only be released through CEC in the form of plant mineralization. Extended use will also promote lower water necessity to obtain the same crop yield because Zeolite can hold up to 60% of its mass in water. Zeolite will also recapture any commercial fertilizer applied to the field retaining it in the root zone for further use.